Ricketts Cricuts: Peachy Keen Sketch Challenge! Hi there!! It has been so long since the last post but I wanted to share my entry with the latest Peachy Keen Sketch challenge!! If you know me, you know I love dogs!! I love how it turned out! I love comments! Please leave me some! That is adorable! Which stamp set is that from? The face stamp is from Peachy Keens Dog face assortment! I love it! THanks for taking the time to play along with our sketch challenge over at Peachy Keen Stamps. Good Luck! omg, this is sooooo cute!!! This is so cute. Love the colors and of course the cute dog. Really sweet dog. I love the face and colours you used. awww so cute!!!! love those faces!! I still haven't used mine! 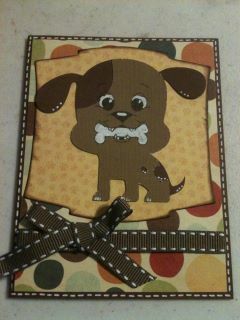 You did it again Kim,I also have a very soft spot for those cute little doggies-absolutly a great card! !